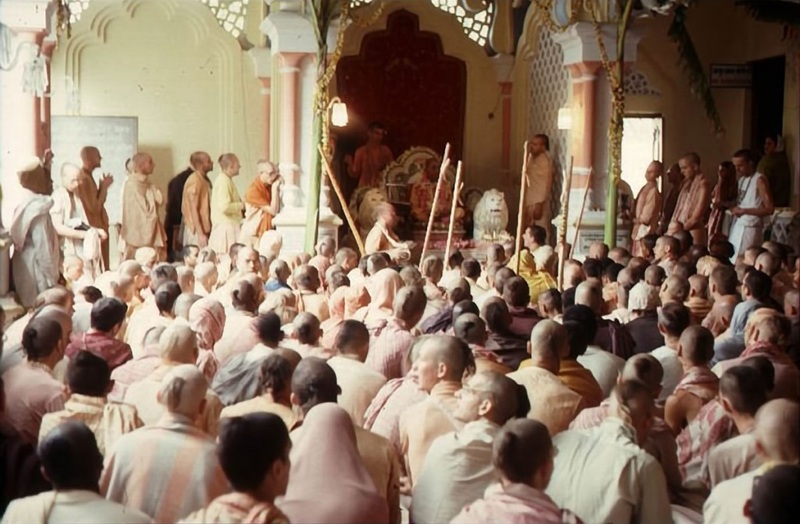 Prabhupāda: No. Kṛṣṇa attracts everyone. Just like magnetic stone attracts iron. But the iron is covered with too much muddy things—the magnetic force does not work. This younger generation, they are not too much dirty; therefore they are very easily attracted. You see? It is like a magnetic force. The same example, that magnetic force attracts iron. That is natural. But if the iron is too much rusty and covered with muddy things, then it does not act. So older generation means they are convinced in some way. They cannot accept any new thing. You see? They are in their last stage of life. Whatever they have understood, they cannot forget. But younger generation, they have got capacity to take new things. Just like nobody goes..., no old man goes to school, because they are unable to receive education. But younger generation, they go. There is a age to receive. So this age is recipient. Therefore naturally, it is nice thing, they are receiving. Reporter: You spoke of initiation. What is that initiation? Prabhupāda: Initiation means formally acceptance of the line of activities in Kṛṣṇa consciousness. Before that, before initiation, we invite everyone to come and sit down with us, chant, dance, take prasādam, hear philosophy. And if he understands, "Oh, this is very nice," then he offers himself to be initiated. Then we accept. Then we impose this restriction, that "If you want to be initiated..."
We get hundreds of letters by everyone who has attended our classes. Daily we are getting some married couples or boys and girls, but most of them are younger. My students are within thirties. The oldest student I have got at the present moment, he is twenty-eight years. No… about thirty years old. That's all. So, of course, I do not get any older people. But that is nice, hopeful, because younger section, if they take it very seriously, then I have hopes that they will preach in future, even in my absence. And old people... If a man becomes too much accustomed to a certain limited habits, in old age it is very difficult to give it up unless one is extraordinarily intelligent.